Happy Friday foodie friends and Happy New Year! I hope 2012 is providing a warm welcome to all of you. I apologize for my absence. As Tina told you, I started a new job right before Christmas and it’s been a whirlwind of training, learning, traveling and HUSTLING! I love it though. For those that don’t know (which is all of you) my educational background is in sport exercise science and nutrition. Health and wellness has always been a passion; even though my only posts on here are for alcoholic beverages (HA) so it’s exciting to finally work in the industry helping people improve their health. Speaking of health, I’m serving up a healthy portion of sparkling sangria for you this week. That’s right; you know we love sangria! I wanted to make something like this for New Years Eve but Tina had to drive 12 hours home from NC that day so we stayed in and went to bed at 10:30. Yep, we’re getting old. Anyway, this sipper may be nice for you who are hosting Super Bowl parties and want to serve something a little lighter than keg beer! This sangria is simple but follows the basic guidelines; dry wine, sliced fruit, sweetener and spirits. I typically like a big, bold, slightly sweet sangria but this time I left it light, subtle and airy with the sparking wine. 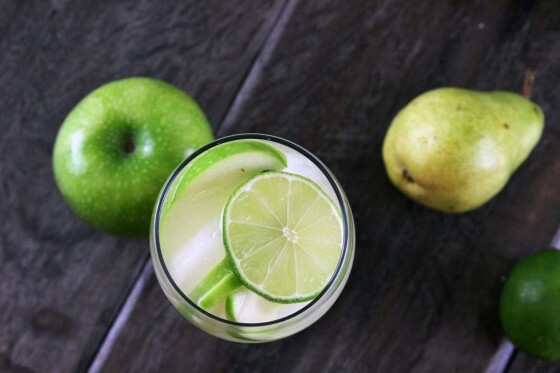 The sweet hints of apple and pear play off the tartness of the wine and lime juice. If you desire to make it sweeter (to taste) just add in a little more simple syrup. 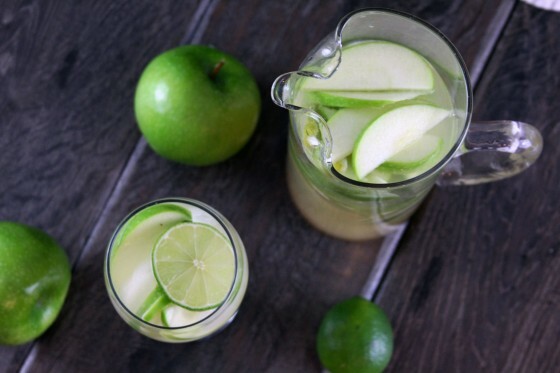 Trust me, however you prepare it, it will taste so good and it looks beautiful in the pitcher. I’m back and I’m excited to make the cocktails flowing in 2012. Happy New Year and CHEERS! Combine the Sangria ingredients in a large pitcher and stir well. NOTE: Be sure to pour the sparkling wine in slowly or the fizz will bubble up and overflow! Add sliced fruit setting aside a few rounds for garnishing the individual glasses. Refrigerate for a few hours, until chilled. Pour over ice in individual glasses and garnish with remaining fruit slices. *Simple Syrup is a mixture of equal parts water, equal parts sugar - You melt (via microwave safe dish in the microwave or a saucepan on the stove) until the sugar is completely dissolved and no longer cloudy. Allow to cool and refrigerate for up to 2 weeks. This looks absolutely lovely! And so very glad to hear that Grammie is doing better! This is so pretty! I love the color scheme….Beautiful photography. I can’t believe how crystal clear it is! Good job too Mike! 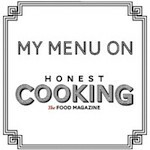 Your food photos are amazing. Can you give an advice on taking your own pictures at home? I’d love to learn a little more. aww thanks so much – i’m totally flattered as I have SOOO much to learn still. But my #1 tip is: natural light, natural light, NATURAL LIGHT!! In the summer, when the days are longer, I shoot out on my porch… In the winter, it’s dark by the time I get home from work, so I bought this reasonably priced Studio lighting that works really well (it comes with “daylight bulbs”! Hope that helps! I am requesting that you bring this up to Georgia for me as soon as this baby is born! 😉 Looks so good! oh i would SO love that! 🙂 🙂 Baby should be here any day now, right?? 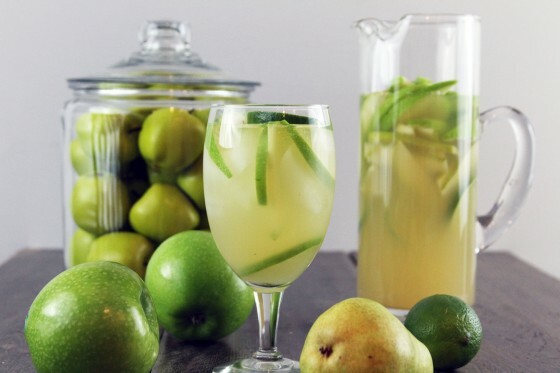 this sounds fantastic & oh-so-refreshing! love the look of it too! so happy to hear that your grammie is doing better… i’ll keep her in my thoughts! SO glad to hear Grammie is doing OK! You all could use a cocktail after a scare like that ;)and this one looks great! 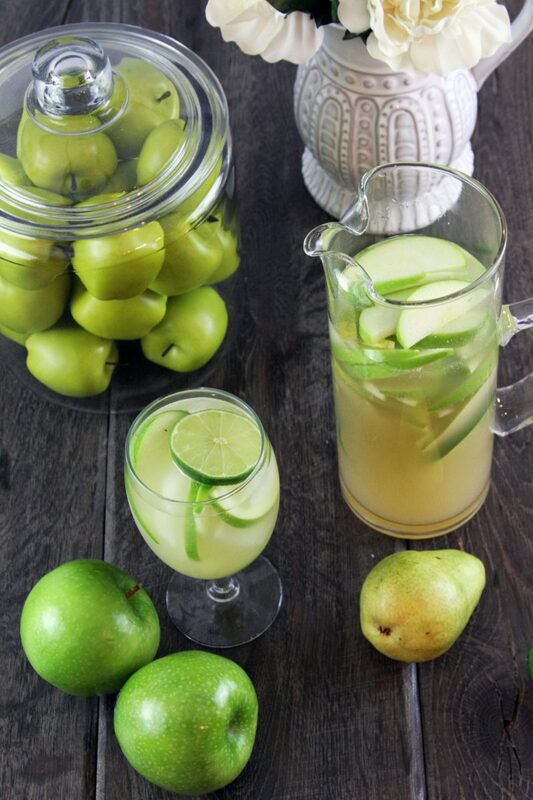 I love sangria, this sounds perfect…Granny Smith apples are my favorite. Glad to hear your Grammie is doing well! I majored in the same thing as your hubs lol so tell him props to the healthiness!!! looks so yummy!! This looks super delish! Love Sangria! Glad Grammie is doing better, will keep saying my prayers for her. I made this for a friend brunch. I already had pear vodka so I subbed that for the apple (I added a little apple juice) and my fiance was making a brown sugar simple syrup for another drink so I used that. It was a hit. I highly recommend it. The pears were so yummy after soaking in the sangria. Thank you!